I can’t remember where I found this exact picture – maybe it was on Craftster, maybe it was on a different craft blog, maybe I just Googled “stuff to put on my depressingly white dorm walls.” In any event, I’ve seen literally dozens of variations on the same theme. 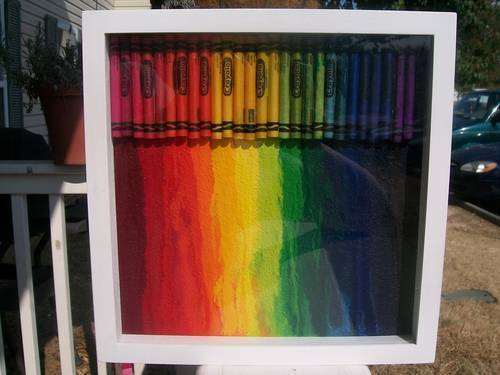 Google Image “melted crayon wall art” and you’ll get the idea. So I’m gonna make it as soon as I get to Target and pick up foam-core board and crayons. And now I have to go back to learning the 27 different consonants and 12 different vowels in English for my Language midterm/reading 6 chapters in “The Divine Dramatist”/studying for bio test. I am a teenager who enjoys baking, embroidery, building & blowing things up, and shooting guns, bows, etc. This entry was posted in Dorm decoration and tagged art, crayon, dorm decor, melted, rainbow, wall art. Bookmark the permalink. GOAAAASHHH!!! I couldn’t stop smiling ! !